MTI introduces the new MT-900042 General Purpose Enclosure with Integrated Antenna, to complement its field proven enclosure kits (<?xml:namespace prefix = "st1" ns = "urn:schemas-microsoft-com:office:smarttags" />1 foot & ½ foot). This document describes the newest addition to MTI’s Integrated Antenna Enclosures family (MT-900007 & MT-900016). The new MT-900042 enclosure with antenna is the ideal solution for professional outdoor wireless applications. It has been designed and manufactured with the utmost care using the best quality materials and components. It features innovative characteristics that enhance the flexibility of the assembled product. This enclosure and antenna assembly is particularly suitable for professional OEM and wireless outdoor applications. The enclosure is made of die-cast aluminum alloy with built-in grounding and shielding of the internal electronic board. The unit is dust and waterproof (IP67) thanks to the high quality materials and a gasket. The enclosure may be purchased with an optional RJ45 Ethernet connector. The optional connector is waterproof and includes a strain relief and internal Cat5E cable. 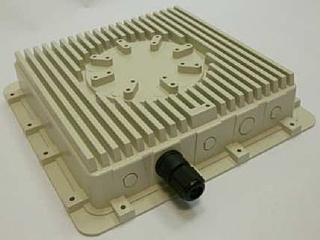 Knock-out holes at the bottom and on top of the case allow easily adding different connectors and up to five additional antennas for MIMO applications. A lightweight, heavy duty mounting kit (die cast aluminum) allows Vertical or Horizontal polarization, as well as Dual Slant wall or pole mounting, with a wide angle tilt. A wide selection of integrated high performance antennas allows long distance links, high throughput and signal stability. The new design of the enclosures includes internal slots for easy and flexible mounting of the electronic boards. The position of the stand-offs may be freely selected to fit your choice of electronics, router boards and radio boards. The heat dissipation fins at the back allow for high power applications. The integrated antenna has an SMA connector to allow easy connection of your RF signal. A wide selection of high performance integrated antennas is available. This includes Single Polarization, Dual Polarization, Dual Slant and other CPE, Omni and BTS antennas in all popular frequency bands (2.4, 3.5 & 5 GHz). · Multiple options for Omni antennas etc. · Internal slots for mounting of PCB, etc. Dependant on selection of integrated antenna.